Draperstown is not known for its marching tradition, but the village will none-the-less turn Orange on June 18 as a major charity cycle sets off on a grand tour of Mid Ulster. The Cycle Against Suicide Spin-Off which as the name suggests, is a follow-on from the main all-Ireland tour, which aims to bring awareness of mental health problems and show solidarity with those who have lost loved ones to suicide in towns rights across the south Derry area. The event, which starts at 10.30am from the BackRow centre in Draperstown, hopes to attract hundreds, maybe even thousands of cyclists of all abilities, as they embark on their route through Desertmartin, Magherafelt, Castledawson, Bellaghy, Gulladuf, Maghera and Tobermore. It is one of only two spin-off events being held in Northern Ireland and was requested by the effervescent Malachy McGuigan, who has already taken part in two of the main Cycle Against Suicide events - earlier this year it visited Cookstown. 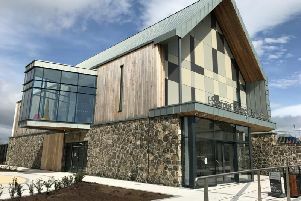 “It was something we asked for, as we know there are a lot of people not just here in Draperstown, but in all the towns in Mid Ulster who have been affected by suicide,” said Malachy - who recently turned 70. “So if you are out driving on the road on June 18 and you get stuck behind a big orange parade of bicycles, just think of the people you know who have been affected by suicide. Malachy’s daughter Grainne and her husband Patrick are also part of the organising committee. “So far the support has been really brilliant, the community here in Draperstown has been fantastic,” said Grainne “and they are getting the word out there, and we want as many people as possible to come along to take part in the cycle - it’s not about speed, no-one will be left behind and there will be cyclists of all abilities taking part, it will be a great day out and for a really great cause. So if you are out driving on the road on June 18 and you get stuck behind a big orange parade of bicycles, just think of the people you know who have been affected by suicide. Karen McGuigan who chairs the very successful STEPS mental health charity in the town, said the event has gained cross-community support. “Of course. We have been contacted by groups and churches from all sides - Rev Carmen Hayes in Tobermore has been brilliant, and hopefully that will be the same in all the towns,” said Karen. Malachy McGuigan is joined by Pauline O'Kane and Anne Birt who are 'Homestay Coordinators' for the Cycle Against Suicide.